The Summer Art Program at James Madison University is posed as an example of a well-established and consistent arts enrichment camp. Started in 1978, Summer Art has been welcoming youth to campus to experience in depth study of the visual and performing arts in professional quality facilities. Purposes and goals of youth arts camps in various settings are explored as a basis for providing engaged community arts services. 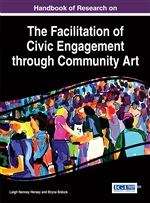 This chapter provides a rich description of all facets of the Summer Art Program from its mission to planning for the final art exhibition. Benefits and challenges to running a community-engaged program along with recommendations for starting or revitalizing an arts enrichment program are also shared. Research studies related to summer camps in the arts are limited. For that reason, the author has expanded the vision of camps and arts programming to include summer camps and after school programs that include art in some way. Programs in the arts, such as after school programs, are included as a form of community arts enrichment that are comparable to camps because they happen outside of a traditional school schedule and may have very different goals and outcomes than school-based arts education. The values of summer camps and arts programs occurring after school or in community settings have been studied from a variety of academic fields. Each program studied has its own goals and reported benefits to attendees. For example, at a creative arts therapy camp, youth ages six to fifteen spend two weeks developing socially and artistically (Buskirk-Cohen, 2015). Campers practiced healthy methods of expressing emotions through art production and building relationships with friends and adults. The performing arts are also sites of interest for study on the development of youth. Will Power to Youth uses the production of an adaptation of a Shakespeare play as a venue for diverse groups of youth and adults to work together. The program combines “theater arts, human relations, academic development, and workplace training” (Aguilar, Bedau & Anthony, 2009, p. 4). Will Power to Youth is defined by the authors as an “initiative that nurtures self-respect, promotes mutual respect, encourages the valuing of differences, increases literacy skills, and fosters an appreciation for the arts among young people” (p. 4). A main goal of the program is to help adolescents develop their emotional intelligence by working with others through dramatic production. In theater production actors and directors are continuously using vocabulary of emotions. By experiencing the constant use of vocabulary of emotion in regards to characters, adolescents who are involved in theater may be able to transfer that vocabulary into their own emotions and life experiences. One benefit of developing emotional intelligence is that it allows us to create deep and meaningful relationships with others (Aguilar, Bedau & Anthony, 2009). Coming from the mental health field, Ersing (2009) studies positive youth development and how it can be implemented in community-based cultural arts programs. “Positive youth development (PYD) is the promising approach that rejects labeling young people as ‘at risk’ for a host of social, emotional, and behavioral problems and instead embraces a philosophy that views youth as capable individuals striving to achieve their full potential” (p. 27). From her research Ersing has noted that, as testing focused school systems reduce arts programs to make more time for the study of core subjects, many youth turn to after-school and community arts opportunities to study and appreciate the arts. Ersing looks specifically at programs that use community and after-school arts programming as a way to create healthy connections between youth and their own community to provide outlets for self-expression, self-discovery, and increasing self-esteem. City councils and community arts coordinators use the arts as methods of community development and improvement. Houbolt (2010) cites a large body of international research “that supports the direct relationship between youth arts projects and the wellbeing of young people, their families and communities” (p. 48) as she argues for the value of four specific projects conducted in New Zealand. Pre-Service Teacher: University students who are enrolled in or actively participating in a teacher licensure program. Community engagement: A process by which the community benefits from long lasting relationships with the mutual vision of improving the community. Authentic Arts Experiences: Opportunities to work with professional quality art materials, equipment, facilities, and access to trained artists. Working in a similar fashion to a professional artist. Certified Art Teacher: A person who has met all of the requirements of their state and obtained a teaching license in art. Outreach: The act of an institution or organization providing services to community members. Lifelong Learning: Engaging in opportunities to learn new concepts and skills throughout ones life span.